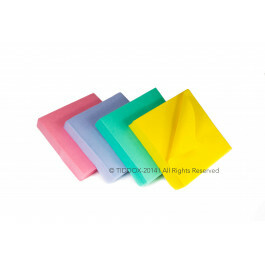 A multi-purpose soft, thick sponge cloth used for rapid soakup tasks in hospitality, healthcare, aged care, schools and child care. Can also be used in automotive and industrial applications that are looking for a fast absorbing material. Heavy weight material with super absorption capabilities - soaks up 8 times its own weight! Are you looking for super cloths that are not only effective but also versatile? MAXI WIPES are the answer to what you are searching for! MAXI WIPES are thick, soft sponge wipes, sometimes called Super Wipes. An extra thick super absorbent wash cloth with a soft texture and sponge like soaking capabilities allowing it to absorb 8 times its own weight in liquid. Used to rapidly soak up spills in Hospitality, Aged Care and Childcare, as well as having Industrial and Automotive applications. Available in various colours for colour coding designating. They are high in viscose content, which gives them their softness as well as their incredible absorbency abilities. Handy, portable, convenient packs of wipes that are known for their ability to quickly absorb spills and dirt. Given their standout characteristics and abilities, these versatile, multipurpose cloths are used in most industries, but particularly in the fields of automotive, industrial cleaning, hospitality, medical and healthcare organisations such as schools, aged care, childcare, hospitals, dental surgeries and even veterinary practices. The AUTOMOTIVE MAXI WIPES are used with auto cleaning chemicals or water as car wash sponges to wash and then dry vehicle body surfaces, as well as absorb and quickly remove dirt and grime off wheels, hubcaps, windows and mirrors. They are also used to clean car interiors. Like mini shammy cloths, these commercial wipes are used by professional detailers, car washes and valeting businesses. Like a sponge, they can be squeezed, rinsed and reused making these washable, long lasting car wash cloths a very economical car care consumable. The HOSPITALITY MAXI WIPES are widely used in restaurants, cafes, hotels, clubs, bars and other food service venues, serving as table wipes, kitchen cloths and counter cloths. With the fast-paced nature of restaurants, bars, coffee shops and the like, cleaning spills need to be mopped up quickly, and these super absorbent cloths do the trick in double quick time. Furthermore, they are colour coded to comply with hygiene standards whereby each task or area is restricted to using a certain colour cloth to prevent the spread of germs and bacteria between areas and tasks that could cause food poisoning. These professional cloths will keep both staff and patrons happy, and leave table counters and surfaces dry and immaculately clean. The INDUSTRIAL MAXI WIPES are used in industrial cleaning applications such as removing factory spills and rapidly absorbing engineering spills, to comply with health and safety regulations. Any water, fuel or other solvent spills are hazards to the workforce and left uncleaned have the potential to cause injury and harm. The industrial absorbency ability of these wipes delivers the cleaning urgency required in such situations, quickly absorbing the threat. MAXI WIPES are also great rag replacement cloths, as they are also soft, more absorbent, certainly cleaner, safer and more hygienic, and are more consistent in size and absorbency than rags, not to mention less bulking - thereby offering attractive savings in storage, freight and wastage! The HEALTHCARE MAXI WIPES are used in hospitals, dental clinics, veterinary clinics, schools, child care and aged care organisations. These organisations take proper hygiene and cleanliness seriously at all times, and find that this highly versatile product offers them a value for money, colour coded, highly effective absorption solution to many of the daily challenges that they face, which range from cleaning medical tools and equipment, to wiping off human and animal urine, vomit and other unwanted spills. Because the wipes are colour coded into four different colors, Red, Blue, Green and Yellow, they allow for a system which can ensure that the same cloth is not used for inappropriate tasks, and rather specific coloured cloths are used for specific tasks or areas, thereby eliminating cross-contamination of germs and bacteria. Typical colour coding systems recommend green cloths are used for food service and food preparation areas, blue cloths are for low risk cleaning areas, yellow cloths are for lower risk or speciality areas, while the red cloths are for high germ areas such as floors, restrooms, urinals and floor surfaces. So if your business is not already using MAXI WIPES , give them a try and enjoy the savings and benefits to be had from using a built-for-purpose, colour coded, super absorbent cloth, that is compactly packaged and available in handy desktop packs! Other related products from TIDDOX 's range of cleaning cloths include the MAXI WIPES CLASSIC , the GIANT TITAN VISCOSE CLOTH, and the GIANT SUPERMAX CLOTH.